The rumors that the next pope will come from Eastern Europe probably arise from the strong wish to see the liberals’ favorite of the moment, Cardinal Vlk of Prague, become the pope. The name of MIL0SLAV VLK has been mentioned in Rome and in other parts of Europe for at least five years. Ordained priest, aged 36. He is one of the few cardinals who never took the Anti-Modernist Oath (of Cardinal Ratzinger). He is a devotee of the Focolare Movement, a form of “spiritual renewal” that has some of the enthusiastic and cultish tones of Opus Dei, or the Communion and Liberation movements, but is much more emotional, much less interested in recruiting men in soft garments, but totally ecumenical nonetheless. He was ordained only after Vatican II had come and gone, and when “the spring of Prague”? had come and gone, too, Vlk was a non-person once more and was obliged to function as an underground priest. Except for Schonborn, Vlk is the only well-known Eastern European. It might be interesting to interject here that I have heard journalists in Rome say the one thing the electing cardinals are not about to do is to choose a new pope right away who is Polish. The candidate will inevitably be compared to Pope John Paul II and look bad, or perhaps even negligible, alongside him. There is no obvious Polish candidate there anyway, and it is evident that the larger-than-life figure of Pope John Paul II could only make any other Polish pope look very small. Some analysts say a lot of cardinals think John Paul II is only too likely to function after his death as a rival to his successor, whoever it may be, so that the cardinals will especially want to find a bishop who is so drastically different from John Paul that people will not think of comparing the two. A non-Italian successor, however, could not possibly be that drastically different from the first non-Italian pope in 450 years. The surprise, the excitement, the glamor, of a non-Italian pope turning up suddenly after those long centuries are unrepeatable, and cannot possibly be recaptured now by anyone, unless perhaps a Martian. Yet one idea that finds support is that Pope John Paul himself would like a successor from the East of Europe, and this is possible, so long as he is not Polish. If he came from somewhere else, anywhere else, the direct and embarrassing comparison with this “super-Pope” need not hang over all that John Paul’s successor might do or say. Does Vlk get the nod? As an underground priest before the Iron Curtain really came down, he was a window cleaner. He wrote an autobiography titled The Window Cleaner about his experiences in those days. He is not very photogenic. Since Vlk is probably the most liberal cardinal in Eastern Europe and manifests a very fierce opposition to the Latin Mass, he is already elected in the minds of many. At present Vlk has virtually replaced the left-wing star of years gone by, Carlo Cardinal Martini, of Milan, Italy, in the dream world of the professional newsmen who will control the reports from Rome. They now say openly what they once found too painful to admit, i.e., any cardinal who is openly liberal is not going to be elected. Martini is pretty open, and he does not live in some remote, exotic country, and he chatters and scribbles all the time. He is fearless. Besides, Martini is anyhow no longer young, or even middle-aged. He will turn 75 and will be expected to resign the Archdiocese of Milan quite soon. He has written an amazing number of books, although nobody ever quotes a single sentence from any of them. Politically he would probably be a first-rate leader since his comments on the Kosovo War last year were among the most impressive of any figure in Europe-brilliant, shrewd, and heart-felt. His being a Jesuit is not an asset. His unwillingness to raise his voice or lift a finger to remedy the glaring problems in his own order, and others, is not in his favor. Cardinals do not like to talk about the endless scandals but these things prey on their minds. His evident contempt for almost everybody in the Curia seems likely to alienate a fair number of voters, and it would suggest that his election would trigger an explosion-a revolution-in the Vatican. But in view of his age it would now be a half-baked revolution. 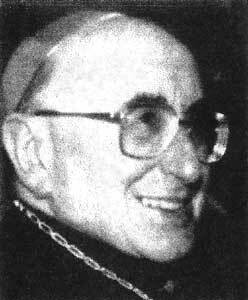 Cardinal Martini’s notorious sympathy with the idea of a married priesthood would bring him immediately into direct conflict with most of the Catholic bishops throughout the world, and give him a highly unpredictable and even dangerous group of supporters. It is only quite recently that the international press, and especially the American press, stopped running articles at fairly regular intervals about the great hope to see Martini become pope. The conservative counterpart to Cardinal Martini, GIACOMO BIFFI, the Archbishop of Bologna, is someone else who would rather be right in his own eyes than be pope, and he will not even reply to the violent attacks on him which occasionally appear in the Italian papers. He has always been known as a sincere and intelligent man, but never, never, as a discreet one. He does not mince words. His favorite new movement is Communion and Liberation. It is an intellectual movement, and in the US its earnest, sometimes badly-dressed adherents are supposed to be generally pretty neurotic, often in therapy. They can discuss ideas and issues of the day intelligently. At the same time it is supremely unfashionable, even anti-fashionable, and never politically correct. It said that a year or two ago Biffi gave a learned address based on a passage from one of the trendiest, wildest, and most spiritual of the Russian writers of 100 years ago. It was a meditation on the likely character of the anti-Christ. The passage he took up for comment was quite unfamiliar, and Biffi’s remarks were widely reported as holding a mad belief that the anti-Christ was alive right now and was an important ecologist in the world of today. Biffi made no effort to correct inaccurate reports, apparently because he thinks of journalists as vermin, and because he would quite seriously rather not be mentioned favorably by them. He is always ready to spit right in their eye, and he takes for granted that they will do the same to him, and apparently thinks it simpler and healthier not to engage in pretenses. People are convinced that he has no wish at all to become the pope and is even pleased to offend people in order to exclude himself. Is that part of a clever campaign to make himself look different from all other available cardinals, and so get the tiara after all? If it is clever to look like you could certainly never be trusted to make some kind of prudent compromise with anybody or anywhere, then he is very clever. But many people do find his remarks refreshing. For one thing, they believe he really means what he says. There seems no point in saying what he does, except that he believes it, and that he thinks it wrong and degrading to flatter the pope, or the press, or the theologians, or the Americans, or the voters, or anybody. People do seem to be tired, not to say exhausted, from the excessive praise Pope John Paul II has meted out in recent years, and Biffi, more than most cardinals, perhaps more than any other, has hinted plainly that John Paul has left a good deal to be desired and made gestures-such as the apology framed to please the Jews so the Pope could gain himself entry into Israel-that inexcusably scandalized people. Undoubtedly, certain men in the Vatican, even certain cardinals who were forced to appear on a stage with the Pope to make the apology, agree. At 72, Biffi is also just about the “?right age,” according to prevailing political wisdom. He is the leading opponent in the Church of Moslem immigration into Italy. He might conceivably function better than anyone else in relation to the right-wing Berlusconi government in Italy, which is not improbably coming in the near future, though it is rash to say that Biffi would be likely to get along with anyone. But quite a lot of his ideas are sensible and popular, though hated by the Italian press. And under the influence of a more right-wing government in the US, the Italian press might very well change. With the exception that follows, Biffi might be the most popular with the Catholics of Italy of all the present cardinals. ERSILIO TONINI is the one and only cardinal who is hugely popular in Italy with normal people who like to watch television, and he is a cardinal precisely for that reason and no other. He is 86 years old. For some reason his words are always simple, clear, entirely unexpected and illuminating. Some people just have that gift. He is not at all aggressive, he is not in the least apologetic, he is not mean-spirited, he is not sugary, he is not long-winded, he is not left-wing. He has spent his life learning how to speak persuasively to the man in the street. He was vice-rector of a seminary at the age of 25, later a rector, and after a career which involved, I think, a lot of religious journalism, was made Archbishop of Ravenna at the age of 61. At 75 he resigned the archdiocese, but being still quite lively, energetic, and full of zeal, he went onto television to explain the Church’s position on all kinds of things to viewers of the tube. For some reason he became a major “star.” At least everybody loved him-it is easy to understand him and hard to quarrel with the way he puts things-and he developed a significant following which very few of the hundreds of other TV preachers in Italy could rival. He always seems to speak as an individual, yet he seems somehow correct and official without provoking resentment. When the Pope heard about his celebrity status, he made the 80-year-old man a cardinal. Because he is passed 80 years, Tonini can’t even vote for the next pope. But he continues to be the voice of the Church, perhaps more than the Pope himself, who after all cannot think like an Italian and must always be utterly correct. Tonini’s expertise was shown most recently on the occasion of the suicide of the heir of the unofficial royal family of Italy, the Agnellis. He said exactly the right thing, in an impossible situation; not a word too much or too little. But he always does. Practice makes perfect. It would take a little imagination for the cardinals to elect Tonini. I don’t think they will do it. It would not be at all strange, though, if they asked his opinion and listened to it carefully. It is probable that the next papal conclave will be a dramatic one. A duel seems possible, or inevitable, between Cardinal Ratzinger and Archbishop (but future Cardinal) Giovanni Battista Re: two prelates who are said to hold opposing opinions about the Tridentine Mass and about the liturgy generally, who are by far the strongest personalities expected to take part in the conclave, and who will sway the most voters. According to the papal profile shaping up in the Curia in anticipation of the conclave, it is going to matter a lot if there are one or two talented, experienced, and agreeable Italian cardinal-archbishops under 70 in northern Italy (behind whom Cardinal Ratzinger will most probably stand) who might be able to match up against Archbishop Re’s old friend, Cardinal Tettamanzi, Archbishop of Genoa, who will inevitably have the strengths (and weaknesses) of appearing to be Archbishop Re’s candidate in the next election. At present it looks like there is going to be no plausible alternative to Tettamanzi between now and 2004, i.e., no plausible alternative, possibly, to a situation in which, whoever may reign, the same person will continue to rule-Archbishop Giovanni Battista Re. One cannot but wonder if Cardinal Ratzinger will fail to notice this odd situation, which might strike him, and might strike a few other people too, as less than satisfactory. In view of the new plan to allow only half of the voters to determine the papal election, instead of two-thirds of them, as in the past elections, a clear split could be quite extraordinarily dangerous, and the Church could within a couple of years have its own Florida impasse as the US just did with its presidential election. And the Church does not have a Supreme Court to deal with such problems.